A baby package（Äitiyspakkaus）is one of the b enefits to mothers expecting babies given by KELA (Social Insurance Institution of Finland). The package contains a lot of items, including baby clothing and care products for babies and mothers. 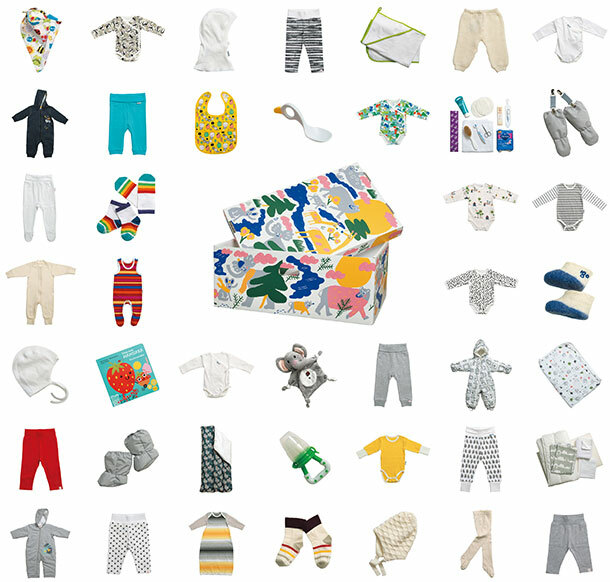 More specifically, a mother can find baby clothing for spring/summer and autumn/winter seasons, cloth diapers, body thermometers as well as contraceptives. She can also find a warm overgarment to cover a baby from the head to the toes for the cold climate. The big box is underlined with polyurethane and can be used as a baby bed until a baby grows out of the cot. The Finnish government offers two options of benefit for mothers, cash provision of 140 Euros (170 Euros from June 2018) or a baby package. There is no upper limit of income for the benefit if a condition to go and get health checkups during pregnancy at neuvola or other health institutions is met. This provides mothers motivation to receive regular health checkups during pregnancy. It is well known that taxation in Finland is high with general consumption tax of 24%. High level of taxation is the foundation of generous social welfare for its 5.5 million citizens. The concept of free baby package was proposed by a private organization and was considered as a payment in kind of maternal benefit in the law enacted in 1937. Before that time, a mother received a basket with basic commodities for baby care and handed it over to another mother with washed clothing when a baby grew old enough. 2018 celebrates the 80th anniversary of the b aby package first distributed in 1938. Since income ceiling was removed from the eligibility criteria in 1949, the benefit has been available for all families expecting babies and the contents has been improved taking cost, usefulness and requests from parents into consideration.